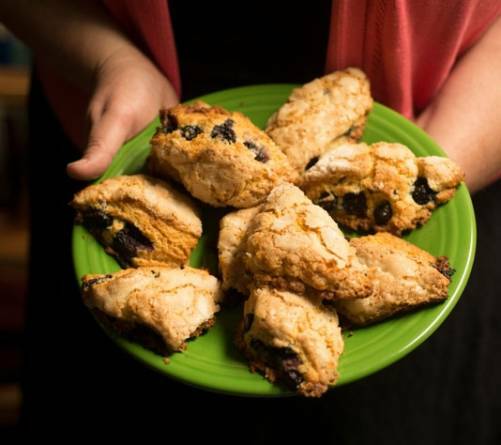 Ki Holste adds fruit to the scones as available. She made blueberry scones for this meal but suggests raspberries, strawberries, peaches, or apples as other tasty alternatives. 2. In a mixing bowl or food processor combine dry ingredients. Cut or pulse butter into flour mixture until butter is the size of small peas. If using food processor, put this mixture in a bowl. Make a well in the butter-flour mixture and pour in combined egg and cream. With a large spoon mix dough until it forms a rough mass. 3. With clean hands, reach to the front of bowl and under dough and bring mixture toward you. Do a quarter-turn of bowl and repeat, folding toward yourself. Repeat another four to six times until the dough feels cohesive. It can still be a bit raggedy but should be one mass. Dump dough onto a floured counter, press down into a rectangle about ¾ inch thick. If adding fruit, press into top of half of dough. 4. Cut a vertical line down center of dough and fold dough onto itself. Press down on dough until it is about 1½ inches high. Spread cream across top of dough and liberally sprinkle with sugar. Dough can be cut into triangles or trapezoid shapes. Place on a baking sheet with about 1 inch between scones. Bake for 14–18 minutes. Enjoy right away.